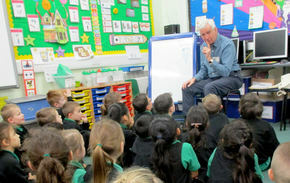 ​Alec is Patron of Reading for Wembrook Primary School, Nuneaton. Alec met staff of Wembrook on 22nd January 2018 to plan this exciting venture. He’s pictured here with Executive Head Teacher Simon Pearson, after discussing with teacher Rachael Tinsley and Head of School Lisa Bayliss some of the ways in which his two-year appointment could help the school encourage children to enjoy stories and poems, and to read for pleasure. ​After the 22nd January meeting, Alec gave a taste of his storytelling to a Year 1 class (see picture, left – an exciting story in progress! 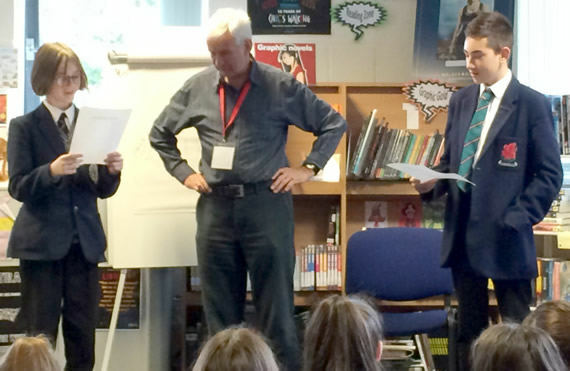 ), and his time as Patron of Reading there started officially with a full day’s ‘launch visit’ on 31st January 2018, during National Storytelling Week, when he told stories and shared poems with groups from Nursery up to Year 2. On 28th March 2018, Alec visited again and told stories to Year 3 and Year 4 groups ('Lazy Jack' was a big hit!). He also made time for sessions with two groups of more reluctant readers, and one group of boys - there was a lot of talking about favourite books! Alec's next visit is booked for 6th June (Year 5 and Year 6 groups), so there are lots more stories to come! 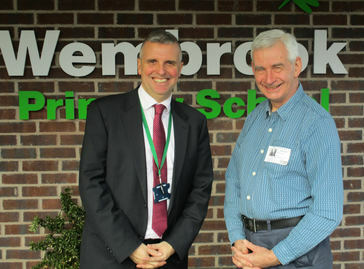 Keep checking this page, to find out more about what’s happening at Wembrook!